Despite what the article below says, neither NFPA nor any other Montana conservation group that I am in contact with has been contacted by Gianforte to set up a meeting to talk about WSAs. In fact, many of our fellow conservation groups are being attacked for our strong stands on this issue. This shows how effective the conservation community has been in influencing public opinion on this issue. According to a recent poll conducted by a partnership of Democratic and Republican pollsters, 87% of Montanans say conservation issues are important considerations in their voting decisions. We will keep up the good work! Furthermore, we must change the language in this debate from “unlocking” or “releasing” WSAs to “removing protection from” WSAs or “losing” these potential wilderness areas forever. Please call Gianforte’s office at 202/225-3211 to express opposition to H.R. 5148 and H.R. 5149. Republican Congressman Greg Gianforte said Thursday he’ll personally meet with people across Montana — including conservationists — who want a say in the controversial issue about unlocking federal Wilderness Study Areas for multiple uses such as motorized recreation, mining or logging. Gianforte has been criticized by some environmental groups for not taking their input on the issue. The congressman said that’s what he’ll be doing throughout August. 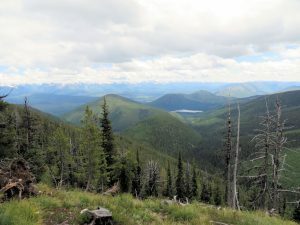 Three types of public lands: Flathead National Forest is in the foreground, left and right; Montana’s Coal Creek State Forest, including Cyclone Lake, is in the middle distance; Glacier National Park stretches across the background. The Flathead Beacon has posted a couple of excellent, well-reasoned op-eds over the past week. The first, by Jim McCormack, titled “What Happened to the Teddy Roosevelt Conservationist?“ takes Secretary of the Interior Ryan Zinke to task for gutting the Land and Water Conservation Fund . The second, “Montanans Want a Say on the Future of Our Wild Public Lands“ by Connie and Mack Long, has some pointed and reasonable things to say about the importance of public involvement when making broad decisions about public lands. No surprises here. A pretty well-designed survey by the University of Montana revealed that people who live in Montana really like their public lands. But, in a related story, Sen. Steve Daines and Rep. Greg Gianforte say they don’t believe it because “they had the support of local county commissions” for legislation to close down several wilderness study areas (WSA’s). You just can’t make this stuff up. Anyways, here’s the lead-in for a good article on the survey. A link for the WSA issue follows . . . The University of Montana 2018 Public Lands Survey showed wide, bipartisan appreciation for the state’s wild places. The poll found four out of five Montanans considered public lands an economic benefit to the state, while just 3 percent said their presence hurt the economy. Amy Robinson, Northwest Montana field director for the Montana Wilderness Association, has a well-written piece in the Flathead Beacon on Wilderness Study Areas . . . Lately we’ve heard a lot from our politicians about public lands and specifically Wilderness Study Areas. I’ve worked on public lands challenges, and wilderness protection, for nearly six years in Northwest Montana. This is a topic I know something about. What are these Wilderness Study Areas? These areas are the headwaters for our communities, our backyard playgrounds, our open, quiet, wildflower-filled prairies, buttes, breaks and badlands. In some places, grizzlies dig for army cutworm moths, wolverines roam free, wildlife graze on winter range, and people hunt, fish, hike, climb, ski, backpack and generally find opportunity for rejuvenation. These areas were protected by Congress in 1977. What’s it all about? Three bills were recently introduced to Congress. One by Sen. Steve Daines and two by Rep. Greg Gianforte. Together, these bills remove protection from 29 different areas totalling over 800,000 acres across our state. These are public lands that are managed either by the U.S Forest Service or Bureau of Land Management. All of these areas have historically been recognized as special and worthy to be considered, and managed, for future Wilderness designation. These protections do matter and are above and beyond the roadless rule. This is something we should all care about and pay attention to. Congressman Gianforte is trailing along with Senator Daines in proposing to eliminate quite a few Montana wilderness study areas . . .
Montana U.S. Rep. Greg Gianforte has drafted two bills proposing to release almost 690,000 acres (279,000 hectares) of wilderness study areas in Montana. One of Gianforte’s bills echoes Montana Sen. Steve Daines’ bill introduced in the Senate late last year. It proposes to release 449,500 acres (182,000 hectares) of wilderness study areas all on national forest lands. The Billings Gazette reports that Gianforte also authored a separate act to release an additional 240,000 acres (97,000 hectares) of Bureau of Land Management wilderness. Here’s a pretty good overview by the Flathead Beacon of Senator Steve Daines’ top-down attempt to close several Montana wilderness study areas. By the way, take a close look at the photo accompanying the Beacon article. The guy handling the oars of that drift boat should look familiar . . .
Scrolling through the Instagram account managed by U.S. Sen. Steve Daines, a conservative Republican from Bozeman, it’s clear he’s hewed a well-established groove in the firmament of Western outdoors pursuits. Populating the first-term senator’s social media feed are pictures of him on backpacking trips deep in the Beartooth Mountains; him bagging ungulates on sunbaked foothills with his wife, Cindy; the family’s mini-Aussies, Reagan and Ruby, chasing mice; and Daines plucking native cutthroat trout from the Yellowstone River. The pictures often bear captions championing public-land access as a cornerstone value in Montana, and they leave behind the politicking inherent to Daines’ work in Washington, D.C.
Daines’ views on public-land access have led him to call for opening up nearly 450,000 acres of federally protected parcels — currently managed by the U.S. Forest Service as wilderness study areas — to a suite of new uses, including logging, grazing and motorized use. On Monday morning, February 5, we helped launch the campaign for our Our Land, Our Legacy – a diverse group of Montanans from across the state who have come together to celebrate and defend Montana’s 44 wilderness study areas (WSAs), which comprise more than 1 million acres of Montana’s wildest, most pristine public lands. Five of our wilderness study areas, a half-million acres in all, are under attack by Senator Steve Daines, who introduced a bill in December (S. 2206) that would open these areas to oil and gas development and destructive off-road vehicle use. Each of the folks featured in Our Land, Our Legacy has a special relationship to one or more of the WSAs and can speak on behalf of these places like few others. We’re proud to have them as our partners in fighting tooth and nail for Montana’s wildest, most pristine public lands. The launch of Our Land, Our Legacy drew a wave of media, locally and nationally, from the Bozeman Daily Chronicle to the Ravalli Republic to U.S News & World Report. On Tuesday, Our Land, Our Legacy advertisements opposing Sen. Daines’ bill appeared in newspapers across the state. Then on Wednesday, the Senate Energy and Natural Resources Committee (SENR) held a hearing on the Blackfoot Clearwater Stewardship Act, which would add 80,000 acres to the Bob Marshall, Scapegoat, and Mission Mountains Wilderness Areas. With support from a spectrum of interests, from timber to outdoor recreation to conservation, this proposal is truly the product of grassroots collaboration happening in Montana, and it shows in the 74 percent approval it gets from Montanans. We couldn’t be more grateful to Senator Jon Tester for championing this bill. The grassroots, bipartisan roots of the Blackfoot Clearwater Stewardship Act stands in stark contrast to the other Montana public lands bill that got a hearing in the SENR on Wednesday – Sen. Daines’ WSA bill. In the hearing, Sen. Daines claimed he had the support of Montana’s communities for this top-down, one-size-fits-all bill. Only a few hours later at a Ravalli County Commission meeting in Hamilton, Montana, MWA members proved Sen. Daines wrong. Thanks to the mobilizing efforts of our staff and volunteers, around 250 people showed up to the open meeting, held to address a letter the commission sent to Senator Daines in support of stripping protection from two of the WSAs in the bill – Sapphire and Blue Joint, which mostly lie in Ravalli County. A staggering 153 people signed into the county meeting as opposed to Senator Daines’ bill, only 41 in support. Over the course of the next few hours, 52 people testified against the bill, 20 in favor. Moreover, 78 people sent the commission emails opposing the bill, compared to 20 in favor. Read more about the meeting. Please take a moment to visit the Our Land, Our Legacy website. Be sure to watch the video featuring some of the Our Land, Our Legacy spokespeople, and then sign the letter asking Montana’s congressional delegation to take a more balanced and inclusive approach to Montana’s WSAs. If you’re feeling especially ambitious, let the Senate Energy and Natural Resources Committee know that you oppose Sen. Daines’ bill, S. 2206. You can email the committee at fortherecord@energy.senate.gov. Two important bills will receive a hearing before the Senate Energy and Natural Resources Committee on Wednesday, February 7. Senator Steve Daines is a member of this committee. Please call Senator Daines’ office today at (202) 224-2651. (1) Ask Senator Daines to SUPPORT S. 507, the Blackfoot Clearwater Stewardship Act. This bill is the result of an agreement reached by a diversity of citizens—mill owners, snowmobilers, mountain bikers, backcountry horsemen, business owners, and conservationists. The bill meets the needs of these diverse forest users, while designating 80,000 acres of new wilderness and solving many other business and recreation problems. Senator Tester proposed this citizen-developed legislation while Senator Daines has refused to endorse it even though 3 out of 4 Montanans support the bill. Let Senator Daines know that he needs to co-sponsor this made-in-Montana legislation. 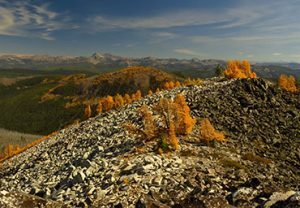 (2) Ask Senator Daines to OPPOSE S. 2206, which will end protection of many of Montana’s Wilderness Study Areas. This bill, introduced by Senator Daines, represents the biggest rollback of protected public land in Montana’s history. Not a single public hearing was held before crafting this legislation affecting almost half of million acres of some of most remote and beautiful public lands in our state, including Big Snowies, Middle Fork Judith, West Pioneers, Sapphire Mountains, and the Blue Joint. Rather than save these lands for future generations to enjoy in their wild state, this legislation could open them for mining, drilling, or destructive development. Ask Senator Daines to withdraw his support for this bill and allow citizens to have a voice in what happens in our wilderness study areas. Thanks for your support of NFPA. From Debo Powers, NFPA President: Conservation organizations around Montana are organizing opposition to Senator Daines’ bill to release Wilderness Study Areas for multiple use. This is an attack on our wild heritage and will be met with fierce opposition. Here is a blog written by John Todd, the Conservation Director for the Montana Wilderness Association . . . He introduced a bill that would strip protection from nearly a half-million acres of our wildest and most pristine public lands. And he did so without holding a single public meeting or a single town hall for Montanans to discuss his bill. His bill would remove protection from five wilderness study areas (WSAs): West Pioneer (151,000 acres), Blue Joint (32,500 acres), Sapphire (94,000), Middle Fork Judith (81,000), and Big Snowies (91,000). If this bill were to pass, it would represent the single biggest loss of protected public lands in our state’s history.